Let's talk about what Tamara can add to your event. 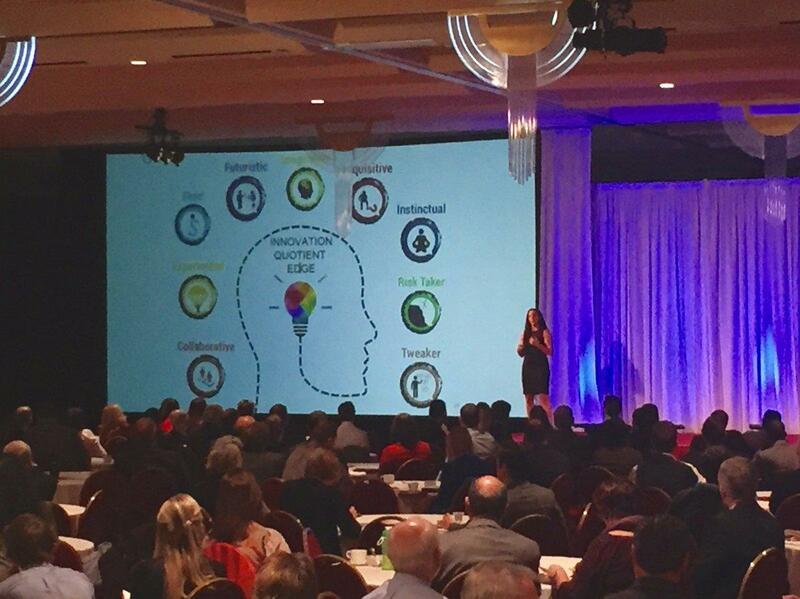 Tamara Ghandour brings her "A" game to each one of her innovation keynotes. She shares big league experiences, extensive research and inspirational, actionable innovation ideas. Participants leave energized and ready to take action. In today’s business climate, organizations cannot afford to maintain the status quo. As competition intensifies, companies must focus on innovation and creativity and differentiate themselves from the competition. And that's where Tamara Ghandour, an incredible innovation keynote speaker, steps in. Before the conference even begins, participants are primed by taking Tamara’s proprietary Innovation Quotient Edge (IQE) Assessment. At the conference, Tamara brings the results of the IQE Assessments to life in a meaningful way showing that everyone can innovate. Participants dig deep with Tamara and really understand the importance of innovation in their personal and professional lives. Sharing true-to-life stories and hands-on activities, Tamara sparks creativity and innovation in each participant. Participants get a clear picture as to why most companies struggle to create a culture that produces consistent innovation. Tamara shows how anyone can create a culture that inspires new thinking, customer focus, experimentation, and business growth. "One of the best keynote sessions, I’ve attended in the recent past. Interesting, Engaging and inspiring. Thank you for sharing your real-life stories." "I had a great time learning about Innovation Quotient Edge (IQE) Assessment at SOCOM. I look forward to reading Think Sideways and learning to Jump on 2!" "I first saw Tamara speak at a Women’s conference. It was during a time when I was reevaluating my business model and needed to find the exact right change. Tamara’s session helped me get out of my own limiting perspective and approach the situation very differently. It is a long story, but this path ultimately led to me selling my company – allowing my business partner (my mom!) to retire. I knew that my local association could benefit from Tamara’s message, so this year I suggested we bring her out to a tradeshow event. The response was overwhelmingly positive. I am still hearing rave reviews!" "Tamara's webinar motivates and engages virtual participants to explore and understand the 9 traits of innovative people. Her session offers participants intuitive and easily digestible tools they can immediately implement to begin fostering a culture of innovation at their workplace. Prepare for a powerful and engaging virtual experience." She shakes things up with "a-ha" moments. With tools you can quickly implement. Hear great stories. Walk away with great tools. "WOWs" happen on and off stage. If you aren’t continually innovating and pivoting, you are on a fast path to irrelevance. To compete in today’s ever-changing, fast-paced landscape, organizations and leaders must learn to create a culture where innovation is the norm and adaptability is the requirement. This is a fast-paced innovation keynote, like the speed today’s business requires. The biggest myth out there killing organizations is thinking that they need more change agents to combat status quo thinking. You don’t need more disruption. It’s happening already all around you. The marketplace, the competition, and the customer are always changing. Someone is always going to disrupt your work. Instead what you need to truly win is change artists, people that are able to leverage and harness change to your advantage. People that are able to transform change from an unknown challenge to a known asset. That’s how you stop spinning your wheels and start winning in today’s fast-paced landscape. The innovator’s mind is curious, bold and always working. It is also inside all of us. But, not everyone innovates the same way. While innovation has become an organizational mandate and critical job description, we expect innovation to be accomplished somehow in the same institutionalized way. This shuts out 99% of your people. Then we wonder why fresh ideas never get created or, when they do surface, why they are never implemented. Tamara’s proprietary Innovation Quotient Edge (IQE) assessment engages the nine key triggers of innovation to identify and leverage your untapped potential. The only assessment that can quantify how you innovative, will show you how understanding Unique Innovation Profiles, especially your own IQE, will help your team discover how to work smart and bring more innovative thinking to work and life. Create an environment where everyone on your team has permission to innovate and deliver their best performance. Your most important customers aren’t the people that buy your products and services. Rather, they’re the people inside your organization. Top-performing organizations recognize that the bottom lines improve most dramatically when their people are engaged enthusiastically. Yet most organizations settle for luke-warm employees and average productivity. In today’s highly competitive marketplace, mere job satisfaction isn’t enough to attract or retain top talent or compete in the marketplace. A culture of innovation is the secret ingredient for enthusiastically engaged employees who work with passion every day. Empower and engage everyone by leveraging the IQEs – Unique Innovator Profiles of your people and the interplay of those profiles among your team. Your innovation mandate sounds like lip-service and nonsensical business-consulting jargon. A bullet point in your value statements or a town hall meeting are not enough. Innovation is the number one skill required from today’s workforce. Yet most are left wondering how the fresh ideas aren’t being generated. Then leaders are left scratching their heads wondering why. What if you could build a team that understands why innovation is important and how to innovate daily? That’s what could happen if you avoid the seven key mistakes and maximize the innovation quotient of your entire organization. Discover the pitfalls of corporate tunnel vision that may be squelching your innovation efforts. Tamara has been taking risks, launching ideas and testing the limits for years. Along the way she has had a lot of successes and a few failures. Learning from every experience, Tamara uncovered the secrets to the success game – being brave enough to zig while everyone else zags. Whether you work in an office, at home or on the road, Tamara’s courageous story of innovation, entrepreneurship and a lot of audacity will inspire you to bust out of the box. You’ll discover how it all comes down to wardrobes, wine and weights. The Innovation Quotient Edge (IQE) Assessment is the only tool that helps you understand your unique Innovator Archetype. So you can retrain your brain to be innovative on demand. Our proprietary Innovation Quotient Edge Assessment (IQE) will assess, measure, and crystalize your unique Innovator Archetype. Unlock your greatest asset - your innovative mind. Based on 20 plus years of work and research, the IQE will help you discover your unique brand of innovation. Prior to Tamara's innovation keynotes, each attendee will be given a custom link to take the assessment, providing incredible value before they even walk through the conference doors. When they leave they’ll be armed with knowledge and insights that impact them directly. If innovation is the theme of your conference, the IQE and Tamara’s keynote will be the change-agent that makes that happen. 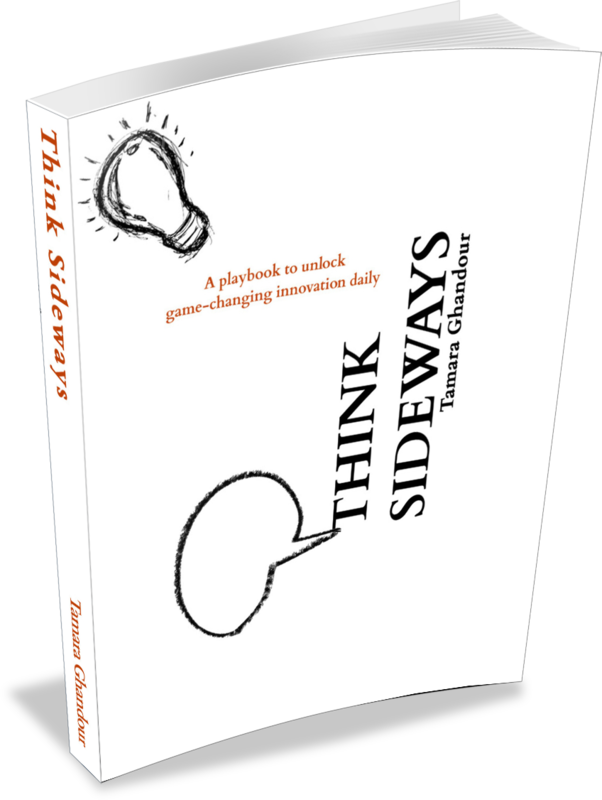 Read "THINK SIDEWAYS" and keep Tamara's innovation activities and lessons at the ready. In this playbook, Tamara Ghandour, innovation keynote speaker, entrepreneur and author, brings to life exercises, ideas, and tidbits to harness your entrepreneurial spirit and unleash the new competitive advantage--your imagination! A perfectly blended mix of insightful observations, powerful storytelling, and practical tools. Reach your creative potential and Think Sideways all day, everyday. CEOs, business executives, entrepreneurs, and aspiring entrepreneurs should keep this playbook at arm's reach at all times. 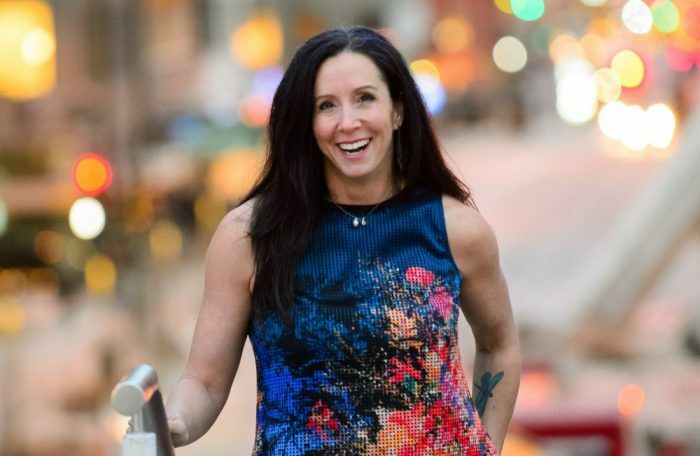 As an added bonus, when you add Tamara's book to your keynote package, attendees will have the opportunity to personally connect with Tamara during a book signing.